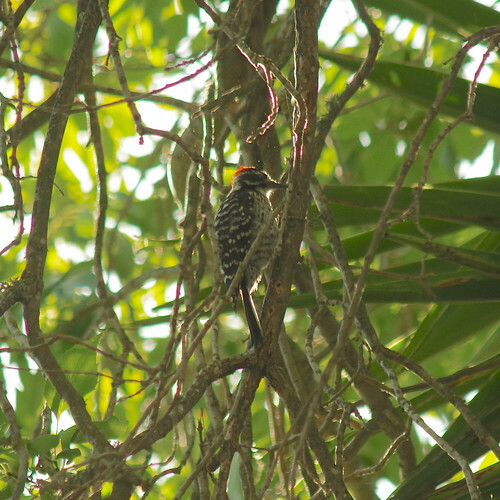 Nuttall’s woodpecker, originally uploaded by schahn. While retrieving a few items from the car I parked out front, I heard the burst of a woodpecker tapping, and grabbed my camera (with an 80 – 320 mm lens for soccer) to see if I could get a good enough picture for identification. The camera rig was much more suitable than the camcorder I used to snap a merlin in 2005. Ben looked at the photo and worked through his options in the AMNH Birds of North America. Based on the range, the barred back, and red crown, he thinks it’s an example of Nuttall’s Woodpecker (but it could be a Ladder-backed or a hybrid of the two). This serene moment of observation ended when the squirrel in that same tree, directly above me, dropped a walnut on my head.